okay, this is so amazing. if you’ve already thought of this, well i hadn’t until now. 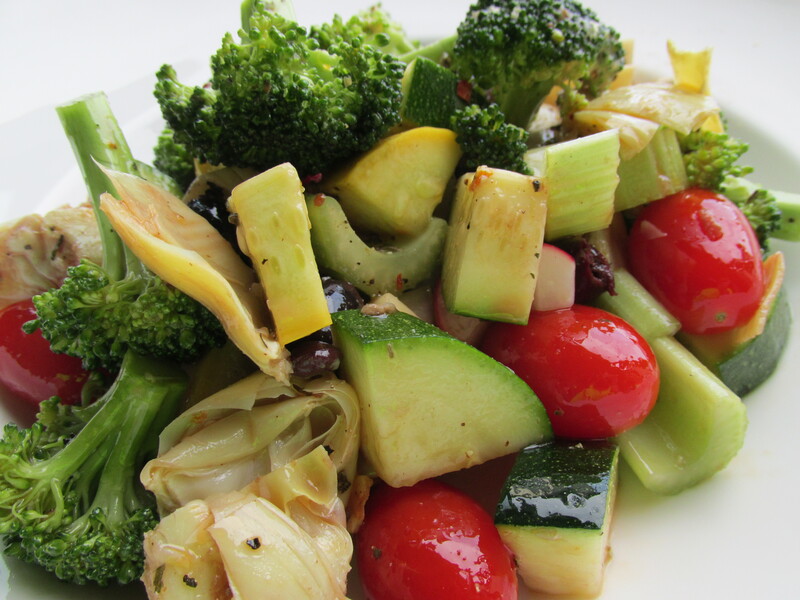 but this is the easiest way to get LOADS of veggies into your diet, in my experience! here’s the idea ~ you buy all the veggies you like at the grocery store (oh man ~ i can’t wait for the farmers’ market to open!). you just prep them and chop them up, and toss them in the vinaigrette of your choice. that’s it! they stay crispy in the fridge for days, but the vinaigrette also helps soften the veggies up just a bit, for easier chewing. like broccoli ~ it’s too chewy and tough for me, sometimes. i make sure to add a jar of pitted kalamata olives and a can of rinsed artichoke hearts. they can really dress up the mix! you can toss them with lettuce or baby spinach and voila! ~ you have a lovely salad. they are so delicious as a side too. or throw them into an omelette? whatever you want to do with these veggies ~ they’ll be fresh and crunchy and satisfying. pour over the veggies and mix well. and drizzle in the olive oil, just like the first recipe. keep it simple! you want these veggies to be versatile. and remember, you’re going to be eating them ALL WEEK. so you might want to go easy on the onions and garlic. also, you might like your vinaigrettes a bit sweeter. if so, add a little honey. i’m gonna get sassy someday and just put frank’s hot sauce all over! buffalo veggies? why not! Previous Previous post: health report 2015.